It's a 70th birthday party for my mother. It's a house and will most likely be outside on our patio (weather permitting). If not, then inside the house. Would like hits from the Gypsy Kings, Eagles, etc. The event runs from 5pm to 9pm. Anytime after 5:30 and before 8 is fine. This is our mother's 90th birthday. She is from south Texas and of strong Mexican heritage. She is quite alert and would fully enjoy a serenade. The party is from 5 to 9pm. Anytime between 5:30 and 8pm would be fine. Arriving on the music scene in the late 19th century, Mariachi Bands brought an upbeat yet traditional sound to Mexican culture. With a blend of guitars, violins, trumpets, the guitarron, and the vihuela, Mariachi music can truly liven up a party! The upbeat authentic Mexican folk music is the perfect accompaniment for wedding receptions, Cinco de Mayo parties, and so much more. 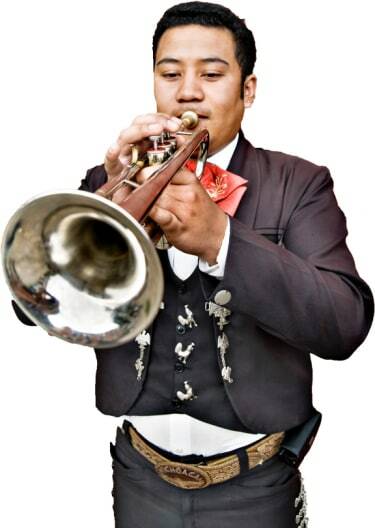 Search for Mariachi Bands in Leesburg, Virginia above. Please note that these Mariachi Bands may also travel to Paeonian Springs, Lansdowne, Broadlands, Ashburn, Hamilton, Lincoln, Waterford, Brambleton, Aldie, Purcellville, Philomont, Dulles, Arcola, Sterling, Poolesville, Stone Ridge, Beallsville, Hillsboro, Round Hill, Middleburg, Dickerson, Tuscarora, Lovettsville, Point Of Rocks, Bluemont, Barnesville, Oak Hill, Great Falls, Chantilly, and Darnestown.